Besides raising ducks, chickens, and silkworms, you can also raise other animals on your farm. You have the option to purchase cows, sheep, goats, horses, and ostriches. No matter what the size of your barn, you can only have 3 species of animals in your barn. This means you can not have 1 of each type of livestock animal. You can choose to keep only 3 at one time. If you had cows, sheep, and horses, and you decided you wanted to buy a goat, you would need to sell all of the cows (or sheep or horses) in order to make room for goats. This gives managing animals some challenge, as you have to decide which ones will work best for your farm. 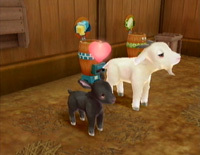 At the very beginning of the game, visit Horn Ranch and go into their livestock barn. You will receive a free baby cow from Cain. As you upgrade the size of your livestock barn and Horn Ranch, new animals will be available for purchase. Livestock animals do come in different colors other than white, but Hanna only sells 1 color-type of each animal. If you want a different color of cow, horse, sheep, or goat you will have to sprinkle it with the Miracle Potion items from her shop. Depending on the animal, the pregnancy will take between 7 and 14 days. Ostriches don't come in any other color besides black. By default, Hanna sells black and white Cows, white Sheep, white Goats, and grey Horses. The color of the baby animal is random. If you are looking for a specific color, and you saved the night before, just keep reloading your save game to rewatch the birthing event until you get the color you want. There are also several Maker machines you can get from Barbara. The machines will convert basic animal products into new versions that sell for more profit. The Butter and Cheese products sell for the same amount. 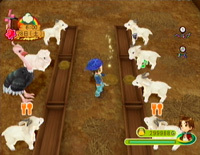 You can ride all of your different type of livestock animals. Before you can ride your animals you will have to raise its friendship up to 5 hearts. To raise an animal's friendship you just have to pet and brush it every day, put fodder in its trough (hand-fed), and let it outside on clear days. To put all your animals outside you just have to ring the giant bell next to your crop field. Super easy! To ride an animal, stand next to it and press the A button. Dismounting is also done by pressing A. Sometimes an animal you leave behind when going to a new area will be transported back to inside the barn. Luckly you can call for a riding mount from anywhere by pressing the A and B buttons at the same time. 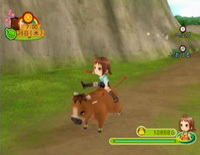 Your character will whistle, calling for one of your rideable animals to appear in front of you. Do not ride your animals in the rain. You will end up with a sick animal. Animal Medicine can be purchased at Hanna's shop for 800 G each. Feeding your livestock animals is by buying Fodder from Horn Ranch (20 G each) or by planting Grass Seeds (20 G each at Marimba Farm) in the fields on your farm. Once full grown, the pasture grass can be left as-is for your animals to graze on when outdoors. You don't need to water pasture grass for it to grow, and it can be harvested into Fodder by cutting it with your sickle. Feeding indoors is more beneficial though. You'll earn more friendship it you hold the Fodder in your hands and give it to each animal than if you simply placed it into the feed bins on the barn floor. Livestock needs to be fed daily and can't go outside on bad weather days to graze on the pasture grass you might be growing. Cows are your simplest livestock animal. They will produce Milk once a day. You can take the milk and convert it into Cheese or Butter. The maker machines are sold by Barbara at her General Store. Cheese and Butter sell for the same amount of profit. The sheep produces two different kind of products. Wool can be collected with the Clippers, and Milk by using the Milker. Even if the sheep doesn't have any wool, you can still ride it around Castanet. Sheep are the only livestock animal that produce two different types of items. You can also take the Wool, change it to Yarn, and then dye the Yarn with the Dyepot in your kitchen. It is good to ship the dyed Yarn if you are stuck with Decent quality, but you'll loose money if you dye yarn that is higher than Decent. You can buy the Yarn Maker at Barbara's General Store for 4500 G after you upgrade your Coop or Barn to level 3. The Dyepot is 3600 G and can also be found at Barbara's shop. Horses are the fastest riding livestock animal you can have. It is good to have a horse for travel if you haven't found all 3 of Theodore's circus friends. The only money you'll earn from Horses is if you breed and sell the offspring. The Horse Miracle Potion costs 1200 G.
Just like cows, goats will produce milk every day. Goats are faster runners than cows though, and they're just cuter! The ostrich is a large bird that won't fit in your poultry barn. Instead it takes up room in your livestock barn, and lays 1 egg every 7 days! Ostriches run faster than goats, but not as fast as horses.